These days, having a home that is secure is more important than ever. Crime is on the rise and families know that they could be the next target. In order to protect your family it is important to take steps to make sure that your house is not chosen as a target and to make sure it is well protected if it is. There are several things you can do to make sure you are safe. Many of these things are relatively inexpensive and when you weigh the costs of not having them they are worth much more. One of the first things burglars look for when they are selecting a target is one that is easy. If your house and yard are dark, this gives them an easy cover to get to your house without being seen. In order to deter criminals from picking your house, make sure your yard is well lit. There are a few ways you can do this. First, make sure the power company has a street light installed outside your home. These are bright and in many cases can light your entire yard. The second thing you will need to do is make sure porch, patio and other external lights have a working bulb at all times. Keep these on at night and in the evening so that entry ways will be well lit. Finally for an extra measure of protection you can place landscape lights in different places around your home. They can add to your curb appeal as well as provide light that keeps criminals at bay. When you leave your home or go to bed at night, it is important to make sure that all doors are locked. You should also make sure that the locks you use are quality. Aside from the lock that is on the handle, it is advisable to purchase a good deadbolt for an extra measure of security. You can also have an additional chain lock along the top of the doo or one that extends from the bottom into the floor. These will help prevent the door from being forced open in the event of a burglary. Remember that locks are useless if the burglar has access to a key. Do not leave keys hidden under door mats, in flower pots or other outside places that a burglar can find them. In many cases they are professionals and know all the potential hiding spots. Plus, they may have staked out your home and watched you use the key at some point. 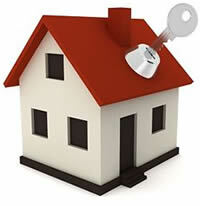 It is bad business if a burglar gets his hand on the key to your home. Finally, one of the absolute best methods of protecting your home and making it more secure is the home security system. These are quite inexpensive and easy to get. There are many home security companies that can help you. The majority of the cost is in having it installed and in some cases; there are price breaks if you sign a contract. Usually the longer the contract is the lower the installation price will be. The actual cost of the monitoring is usually between 10 and 15 dollars per month. This is a small price to pay for the protection of your belongings and your family. The alarm system company will warn you in the event of a forced entry, and they can include panic buttons in case you are caught unaware. They will also monitor your home to help you in the event of a fire or other life threatening situation.